Christmas is right around the corner and you know what that means (NO, not lots of presents!) 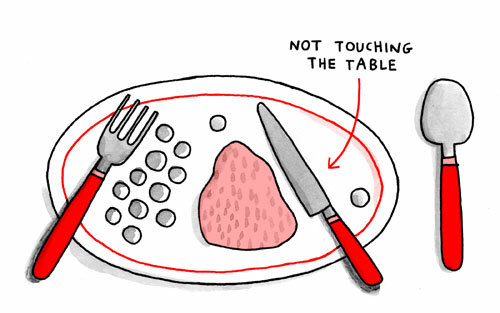 your bound to being eating a holiday meal at someone else table, whether it’s at your grandparents house or maybe even your new boyfriend’s family, you don’t want to be caught with bad manors at the table! 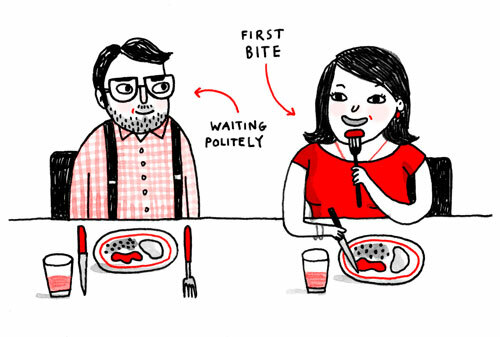 I feel sometimes my generation missed a step along the way, etiquette schools no longer exist (do they?) and while I had a set of grandparents that wanted to make sure I knew the proper way ladies should sit at the table and how to set one, I probably never would have learned had it not been for them (and you mom!). Even though our world has become pretty informal (I wear jeans to work everyday and when I have to dress up I feel like a alien has taken over my body) but heavens to Betsy your future mother-in-law asks you to set the table and you put the forks and knives on the wrong sides… you’ve gone from husband material to eating at the kids table in a matter of seconds (which would probably be more fun anyways…). I found this cute “Dinner Etiquette” guide with some illustrations (for those of you who are more visual learners) on one of my favorite new blogs, “A Cup of Jo”. Hopefully her guide will help you out this holiday season! Enjoy! If you’re a guest at a dinner party (pictured above), wait to start eating until the host or hostess takes his or her first bite (unless they absolutely insist that you start). 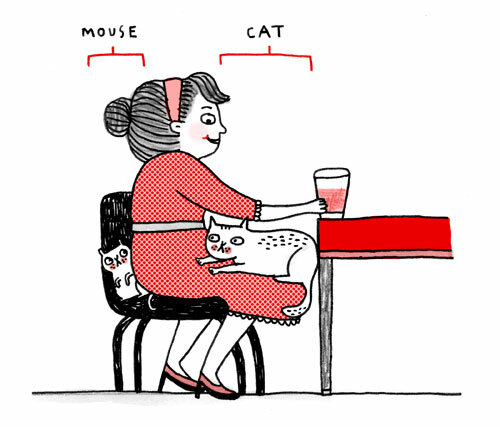 A funny tip that my grandparents used to tell us: The way to sit in your chair is to pretend a cat is in front of you, a mouse is behind. Scoop your soup with your spoon tilted *away* from you. 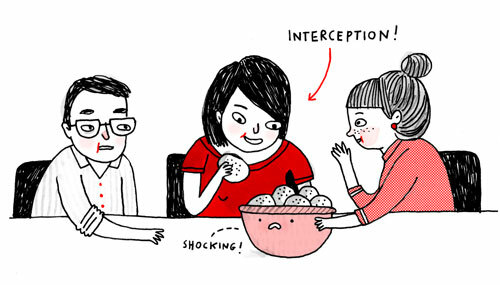 And surprise! 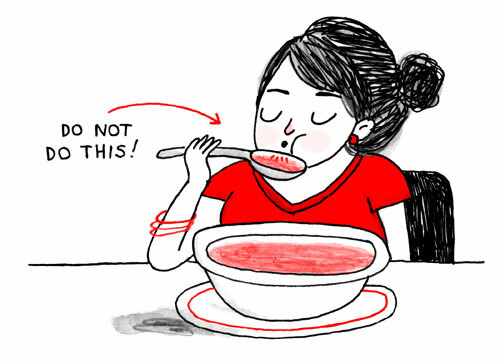 It’s fine to tilt the bowl slightly away from you to get the last drop of soup. But never blow on your soup or food. Even if it’s piping hot! Always taste your food before putting on salt and pepper. 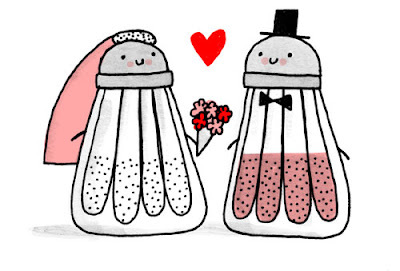 It’s considered rude to assume the food is under-seasoned before tasting it. 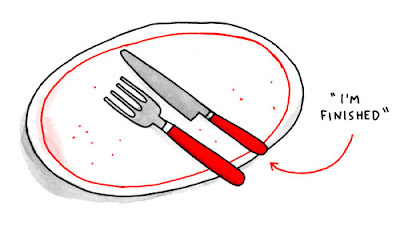 When you are finished with your meal, your knife and fork should be placed on your plate diagonally from upper left to lower right (11 to 5 if you imagine your plate as a clock face). 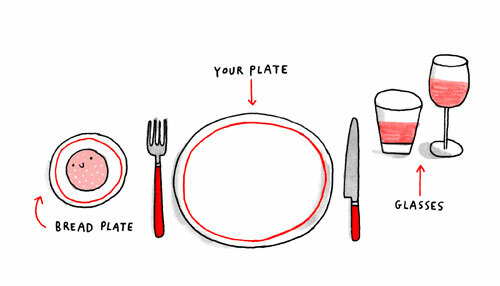 This is a secret code to the waiter (or host) that you’re finished. 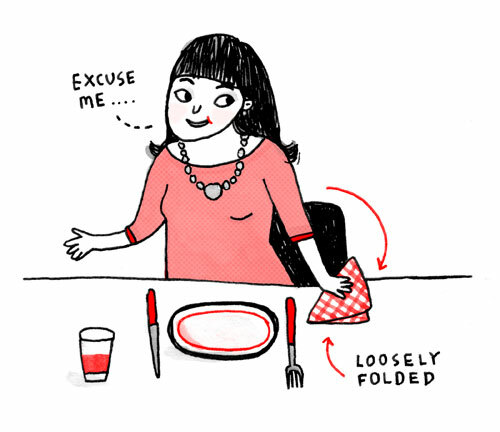 If you have to go to the bathroom—or if you’re getting up at the end of the meal—just put your napkin to the left of your plate, loosely folded. Yay, that’s it! Bon appetit! This entry was posted in Items of Interest and tagged dinner etiquette by skibootsinthekitchen. Bookmark the permalink. THANKS! I’ll see you Sat: I forgot that I have a hair appt at 9 tomorrow! I hope you have your sweater ready!!! !